Two-times champions Esperance came from 2-0 down to beat KCCA of Uganda 3-2 and stay top of their African Champions League group. A late strike, nine minutes from time, secured the win, and puts them 3 points ahead of Egypt's Al Ahly. Al Ahly, in their first game under new coach Patrice Carteron, beat Botswana's Township Rollers 3-0. Elsewhere, there was a shock defeat for Mamelodi Sundowns and TP Mazembe kept up their 100 percent winning record. GROUP A: Ahly went into their home game with Township Rollers saying that anything other than a win would be "unacceptable". Former coach Hossam al-Badry resigned after the 8-times winners were beaten in their second match of the group stage and Wednesday's clash with Rollers was his replacement's first game in charge. And it all went smoothly, as they earned a comfortable 3-0 win. 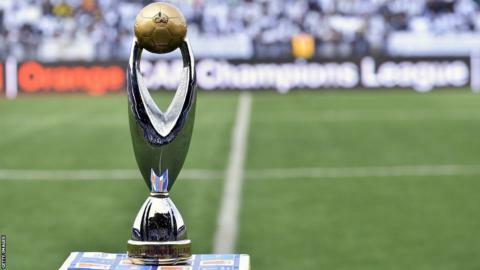 That puts them back to second in the table, behind Tunisia's Esperance - who were hugely discomfited by Uganda's KCCA. The east Africans took a 2-0 lead at the Rades Stadium, but the double strike stung their hosts and by half time they were level. Bilel Mejri got the winner on 81 minutes and Esperance are three points clear. Rollers' coach blamed "naivety and inexperience" for his side's failure to hold on to their advantage. Group B: Patrice Carteron's former club, TP Mazembe of DR Congo, just about kept up their 100 percent winning record. But they left it late at home in Lubumbashi against Mouloudia Alger. Elia Mechak got the only goal of the game with just two minutes remaining. That win keeps up Mazembe's perfect record, and they are 5 points clear of Mouloudia in the standings. The other game in this group saw Entente Setif of Algeria pip their Moroccan rivals Difaa el Jadida with a last minute winner to take the game 2-1. Group C: Defending champions Wydad Casablanca were held 1-1 in Conakry by Horoya of Guinea, and both teams are tied at the top on 5 points in the standings. Wydad took the lead on 26 minutes but the home team were level three minutes later. Bottom of the pool are South Africa's former winners, Mamelodi Sundowns, who were handed a surprise loss in Togo by Port of Lome. Abel Hundele scored the only goal of the game five minutes before the break. Group D: Tunisia's Etoile du Sahel put in a strong performance to earn a 3-0 away win over Mbabane Swallows in Swaziland - Karim Aouadhi, Maher Hannachi and Amine Chermiti got the goals. That gives them a three point advantage over Swallows at the top of the pool. Zambia's Zesco United and Primeiro Agosto of Angola both have just two points from their first three games, after playing out a 0-0 draw in Ndola.